Adware - A form of spyware that collects information about the user in order to display advertisements in the web browser based on the information it collects from the user's browsing patterns. Backdoor - Also called a trapdoor. An undocumented way of gaining access to a program, online service or an entire computer system. The backdoor is written by the programmer who creates the code for the program. It is often only known by the programmer. A backdoor is a potential security risk. Backup - To copy files to a second medium (a disk or tape) as a precaution in case the first medium fails. One of the cardinal rules in using computers is back up your files regularly. Bandwidth - The amount of data that can be transmitted in a fixed amount of time. For digital devices, the bandwidth is usually expressed in bits per second(bps) or bytes per second. For analog devices, the bandwidth is expressed in cycles per second, or Hertz (Hz). Browser - A software application used to locate and display Web pages. The two most popular browsers are Mozilla, Netscape Navigator and Microsoft Internet Explorer. Both of these are graphical browsers, which means that they can display graphics as well as text. In addition, most modern browsers can present multimedia information, including sound and video, though they require plug-ins for some formats. Cable Modem - A modem designed to operate over cable TV lines. Because the coaxial cable used by cable TV provides much greater bandwidth than telephone lines, a cable modem can be used to achieve extremely fast access to the World Wide Web. This, combined with the fact that millions of homes are already wired for cable TV, has made the cable modem something of a holy grail for Internet and cable TV companies. There are a number of technical difficulties, however. One is that the cable TV infrastructure is designed to broadcast TV signals in just one direction - from the cable TV company to people's homes. The Internet, however, is a two-way system where data also needs to flow from the client to the server. In addition, it is still unknown whether the cable TV networks can handle the traffic that would ensue if millions of users began using the system for Internet access. Crapware - Software that either comes with a new PC or is bundled with other software, but is not essential and usually degrades the performance of the computer. Spyware, malware and adware fall under this definition. CPU (Central Processing Unit) - The brains of the computer. Sometimes referred to simply as the processor or central processor, the CPU is where most calculations take place. In terms of computing power, the CPU is the most important element of a computer system. Defrag - A DOS and Windows utility that defragments your hard disk. Desktop - A metaphor used to portray file systems. 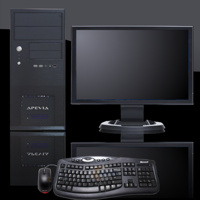 Desktops consists of pictures, called icons, that show cabinets, files, folders, and various types of documents (that is, letters, reports, pictures). You can arrange the icons on the electronic desktop just as you can arrange real objects on a real desktop - moving them around, putting one on top of another, reshuffling them, and throwing them away. Domain Name - A name that identifies one or more IP addresses. For example, the domain name microsoft.com represents about a dozen IP addresses. Domain names are used in URLs to identify particular Web pages. DSL (Digital Subscriber Lines) - Two main categories of DSL are ADSL and SDSL. Also two other types of DSL technologies exist - High-data-rate DSL (HDSL) and Very high DSL (VDSL). DSL technologies use sophisticated modulation schemes to pack data onto copper wires. They are sometimes referred to as last-mile technologies because they are used only for connections from a telephone switching station to a home or office, not between switching stations. DSL is similar to ISDN where both operate over existing copper telephone lines (POTS) and both require the short runs to a central telephone office (usually less than 20,000 feet). However, DSL offers much higher speeds - up to 32 Mbps for upstream traffic, and from 32 Kbps to over 1 Mbps for downstream traffic. Extension - One or several letters at the end of a filename, though usually three. Filename extensions follow a period (dot) and indicate the type of information stored in the file. For example, in the filename EDIT.COM, the extension is COM, which indicates that the file is a command file. Fragmentation - The condition of a disk in which files are divided into pieces scattered around the disk. Fragmentation occurs naturally when you use a disk frequently, creating, deleting, and modifying files. At some point, the operating system needs to store parts of a file in noncontiguous clusters. This is entirely invisible to users, but it can slow down the speed at which data is accessed because the disk drive must search through different parts of the disk to put together a single file. Inkjet Printer - A type of printer that works by spraying ionized ink at a sheet of paper. Magnetized plates in the ink's path direct the ink onto the paper in the desired shapes. Inkjet printers are capable of producing high quality print approaching that produced by laser printers. A typical ink-jet printer provides a resolution of 300 dots per inch, although some newer models offer higher resolutions. IP Address - An identifier for a computer or device on a network. Networks using the TCP/IP protocol route messages based on the IP address of the destination. The format of an IP address is a 32-bit numeric address written as four numbers separated by periods. Each number can be zero to 255. For example, 1.160.10.240 could be an IP address. Kilobyte - In decimal systems, kilo stands for 1,000, but in binary systems, a kilo is 1,024 (2 to the 10th power). Technically, therefore, a kilobyte is 1,024 bytes, but it is often used loosely as a synonym for 1,000 bytes. For example, a computer that has 256K main memory can store approximately 256,000 bytes (or characters) in memory at one time. Kilobyte is usually abbreviated as K or KB. To distinguish between a decimal K (1,000) and a binary K (1,024). LAN (Local Area Network) - A computer network that spans a relatively small area. Most LANs are confined to a single building or group of buildings. However, one LAN can be connected to other LANs over any distance via telephone lines and radio waves. A system of LANs connected in this way is called a wide-area network (WAN). Laser Printer - A type of printer that utilizes a laser beam to produce an image on a drum. The light of the laser alters the electrical charge on the drum wherever it hits. The drum is then rolled through a reservoir of toner, which is picked up by the charged portions of the drum. Finally, the toner is transferred to the paper through a combination of heat and pressure. This is also the way copy machines work. Usually much faster than inkjet printers. MAC Address (Media Access Control Address) - A hardware address that uniquely identifies each node of a network. In IEEE 802 networks, the Data Link Control (DLC) layer of the OSI Reference Model is divided into two sublayers: the Logical Link Control (LLC) layer and the Media Access Control (MAC) layer. The MAC layer interfaces directly with the network medium. Consequently, each different type of network medium requires a different MAC layer. MAC Filtering - Blocking Internet traffic based on the MAC Address, usually used in wireless networks. Memory - Internal storage areas in the computer. The term memory identifies data storage that comes in the form of chips, and the word storage is used for memory that exists on tapes or disks. Moreover, the term memory is usually used as a shorthand for physical memory, which refers to the actual chips capable of holding data. Some computers also use virtual memory, which expands physical memory onto a hard disk. Motherboard - The main circuit board of a microcomputer. The motherboard contains the connectors for attaching additional boards. Typically, the motherboard contains the CPU, BIOS, memory, mass storage interfaces, serial and parallel ports, expansion slots, and all the controllers required to control standard peripheral devices, such as the display screen, keyboard, and disk drive. Collectively, all these chips that reside on the motherboard are known as the motherboard's chipset. Network - Connecting two or more computers together with the ability to communicate with each other. PC (Personal Computer) - The term came to mean IBM or IBM-compatible personal computers, to the exclusion of other types of personal computers, such as Macintoshes. In recent years, the term PC has become more and more difficult to pin down. In general, though, it applies to any personal computer based on an Intel microprocessor, or on an Intel-compatible microprocessor. For nearly every other component, including the operating system, there are several options, all of which fall under the rubric of PC. 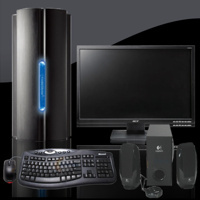 Peripheral Device - A computer device, such as a CD-ROM drive or printer, that is not part of the essential computer, i.e., the memory and microprocessor. 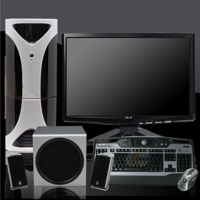 Peripheral devices can be external - such as a mouse, keyboard, printer, monitor or scanner - or internal, such as a CD-ROM drive, CD-R drive or internal modem. 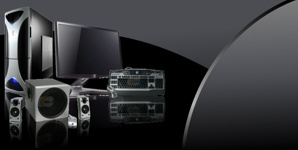 Internal peripheral devices are often referred to as integrated peripherals. Phishing - The act of sending an e-mail to a user falsely claiming to be an established legitimate enterprise in an attempt to scam the user into surrendering private information that will be used for identity theft. The e-mail directs the user to visit a Web site where they are asked to update personal information, such as passwords and credit card, social security, and bank account numbers, that the legitimate organization already has. The Web site, however, is bogus and set up only to steal the user’s information. Pop-up Ad - A type of window that appears on top of (over) the browser window of a Web site that a user has visited. In contrast to a pop-under ad, which appears behind (in back of) the browser window, a pop-up is more obtrusive as it covers other windows, particularly the window that the user is trying to read. Pop-ups ads are used extensively in advertising on the Web, though advertising is not the only application for pop-up windows. RAM (Random Access Memory) - A type of computer memory that can be accessed randomly; that is, any byte of memory can be accessed without touching the preceding bytes. RAM is the most common type of memory found in computers and other devices, such as printers. The most common size sticks of RAM used today are 256mb and 512mb, though a variety of sizes exist. Rootkits - A rootkit is a type of malicious software that is activated each time your system boots up. Rootkits are difficult to detect because they are activated before your system's Operating System has completely booted up. A rootkit often allows the installation of hidden files, processes, hidden user accounts, and more in the systems OS. Rootkits are able to intercept data from terminals, network connections, and the keyboard. Spam - Electronic junk mail or junk newsgroup postings. Some people define spam even more generally as any unsolicited e-mail. However, if a long-lost brother finds your e-mail address and sends you a message, this could hardly be called spam, even though it's unsolicited. Real spam is generally e-mail advertising for some product sent to a mailing list or newsgroup. Trojan Horse - Full of as much trickery as the mythological Trojan Horse it was named after. The Trojan Horse, at first glance will appear to be useful software but will actually do damage once installed or run on your computer. Those on the receiving end of a Trojan Horse are usually tricked into opening them because they appear to be receiving legitimate software or files from a legitimate source. When a Trojan is activated on your computer, the results can vary. Some Trojans are designed to be more annoying than malicious (like changing your desktop, adding silly active desktop icons) or they can cause serious damage by deleting files and destroying information on your system. Trojans are also known to create a backdoor on your computer that gives malicious users access to your system, possibly allowing confidential or personal information to be compromised. Unlike viruses and worms, Trojans do not reproduce by infecting other files nor do they self-replicate. Virus - A computer virus attaches itself to a program or file so it can spread from one computer to another, leaving infections as it travels. Much like human viruses, computer viruses can range in severity: Some viruses cause only mildly annoying effects while others can damage your hardware, software or files. Almost all viruses are attached to an executable file, which means the virus may exist on your computer but it cannot infect your computer unless you run or open the malicious program. It is important to note that a virus cannot be spread without a human action, (such as running an infected program) to keep it going. People continue the spread of a computer virus, mostly unknowingly, by sharing infecting files or sending e-mails with viruses as attachments in the e-mail. WAN (Wide Area Network) - A computer network that spans a relatively large geographical area. Typically, a WAN consists of two or more local-area networks (LANs). Computers connected to a wide-area network are often connected through public networks, such as the telephone system. They can also be connected through leased lines or satellites. The largest WAN in existence is the Internet. Worm - Similar to a virus by its design, and is considered to be a sub-class of a virus. Worms spread from computer to computer, but unlike a virus, it has the capability to travel without any help from a person. A worm takes advantage of file or information transport features on your system, which allows it to travel unaided. The biggest danger with a worm is its capability to replicate itself on your system, so rather than your computer sending out a single worm, it could send out hundreds or thousands of copies of itself, creating a huge devastating effect. One example would be for a worm to send a copy of itself to everyone listed in your e-mail address book. Then, the worm replicates and sends itself out to everyone listed in each of the receiver's address book, and the manifest continues on down the line. Due to the copying nature of a worm and its capability to travel across networks the end result in most cases is that the worm consumes too much system memory (or network bandwidth), causing Web servers, network servers and individual computers to stop responding. In more recent worm attacks such as the much-talked-about .Blaster Worm., the worm has been designed to tunnel into your system and allow malicious users to control your computer remotely. ZIP File - A type of data compression, enabling many files to be compressed into one - usually ending with a .ZIP extension. and many other NY areas.